Come and try the true taste of Tuscan! The Villa di Geggiano has for more than five centuries, under the auspices of the Bianchi Bandinelli family, been renowned for superb hospitality and generosity – as well as delicious food and sumptuous wines. Located in Chianti at the heart of Tuscany and surrounded by vineyards and stunning gardens, it has a history of exporting mouth-watering wines to England – having been possibly the very first to bring Chiati here in 1725. 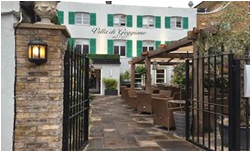 Now, all the elegance, style and – most importantly, flavours of that region are to be found in Chiswick High Street at the new Restaurant Villa di Geggiano (Chiswick). The menu features true Tuscan cuisine, with many of the ingredients being imported especially from the Villa and surrounding farms to the UK for the first time ever. Prepared with passion by a hand-picked crew, these maestros employ traditional techniques to recreate the essence of Siena. The care which goes into the menu is matched only by the attention to detail with which this landmark has been transformed into an elegant yet comfortable place to relax and enjoy good food, great wine and excellent company. As in Italy, creativity is very proudly prized at the Villa di Geggiano London. There will be guest chefs offering tastings of truffles as well as classic Italian ice cream. And creativity doesn’t stop at the kitchen ‘pass’. The restaurant welcomes all those with creative skills and talents. Space is offered on the walls for local artists to mount exhibitions, and there will be poetry readings and live entertainment. The Villa di Geggiano also features a Estate Shop (which you walk past on your way into the restaurant). There, you’ll find wines, cheeses, cured meats, pastas and preserves imported especially from the Villa and local estates. Plus there’s an excellent selection of breads and pastries – all freshly made and all waiting to be devoured either in the café, or at home. And at the well-stocked bar, you’ll enjoy classic Tuscan cocktails, not to mention the glorious wines for which the region is renowned. All in all, the Villa di Geggiano is a little corner of Tuscany, right at the heart of W4.